Shirley Temple Doll, Ideal Doll & Novelty Co., 1934. For doll collectors, the Shirley Temple doll is a known quantity. Most collectors know that if you have one or can get one, these dolls can catch a pretty penny depending on the year and the condition. The lovable, adorable Shirley Temple was a symbol of hope during the dark, despair-filled days during the Great Depression. The child actress had a stream of No. 1 box office hits in the 1930s. In October 1934, Ideal Toy Corporation applied for a patent, and the Shirley Temple doll was officially announced in an issue of the retail industry magazine “Playthings.” Shirley Temple dolls come in many varieties, but the most popular and lasting version has been the composition doll, first made when Shirley Temple was a star. The Shirley Temple dolls made in composition were fabricated from a composite of glue mixed with sawdust. This method was commonly used to make doll heads and limbs from the 1920s through the 1950s. The dolls had open-mouthed smiles and a choice of precious red, blond, and brunette curls. The dolls ranged in size from 11-inches to 27-inches tall, and they sold very well when they were new. Later versions of Shirley Temple dolls were made in vinyl versions by Ideal. The vinyl versions made in 1957 are the most desirable to collectors. Some of these dolls were made up to 3-feet tall. These were the "playpal" variety. The 1990s saw porcelain commemorative dolls made in Temple’s likeness being sold as collectibles. The likeness of Temple had also been made into a paper doll many times. Though the dolls have been produced since the 1930s, there have been several gaps in production, including in the 1960s and '70s. The 1930s composition-made dolls tend to craze and crack when not stored properly, so only dolls that are in excellent to mint condition bring the highest values. Rare or unusual outfits complete with an original doll can also add a good sum to the overall value. Only mint-condition dolls in their original boxes can sell for $1,000 to $2,000, as can rarer varieties like the baby Shirley dolls. The 1957 vinyl Shirley Temple dolls sell for much more than the later early 1970s Shirley dolls. The 1957 dolls average about $100. The price difference is determined by the size, the outfit, the condition, and if the original box still exists. The re-released Shirley Temple vinyl dolls in 1982 generally sell for less than $25 even if mint in the box. Danbury Mint porcelain dolls from the 1990s resell at a wide range of prices from $10 to $150. The best-known company that produced the Shirley Temple dolls was Ideal. Ideal produced the dolls from the 1930s until the company went out of business in the early 1970s. Danbury Mint created most of the collectible porcelain versions of the doll. In 1960, the first Shirley Temple Collectors Club was established. 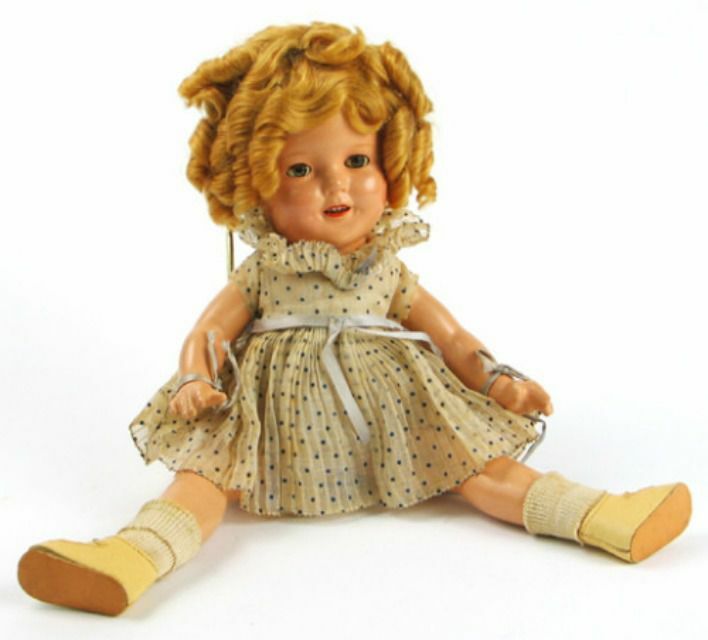 From the '60s through the '80s, new Shirley Temple dolls were regularly distributed by companies like Montgomery Ward and Danbury Mint, which was aimed primarily at nostalgic adult collectors.